Atheneum Books for Young Readers, 9781534419155, 256pp. Ever since the Germans became the unwelcome “guests” of Paris in the early days of World War II, Papa and Chantal have gone out in the evenings to fish in the Seine. Tonight Chantal is hoping for a salmon, but instead she spies something much more special: a whale! Though small (for a whale) and lost, he seems friendly. Chantal soon opens her heart to the loveable creature and names him Franklin, after the American president who must surely be sending troops to rescue her country. Yet Franklin is in danger: The Parisians are starving and would love to eat him, and the Nazis want to capture him as a gift to Hitler. In a desperate bid to liberate themselves and their city, Chantal and Franklin embark on a dangerous voyage. But can one small girl manage to return a whale to the ocean and reunite him with his parents? And will she ever see her own family again? American screenwriter Daniel Presley’s award-winning film Populaire was released in thirty-five countries. His fiction has also appeared in various literary journals. He lives with his wife, Dutch novelist Claire Polders in Paris, and together they are the creators of A Whale in Paris. Dutch novelist Claire Polders has published four novels. Her writing in English can be found in various literary journals. 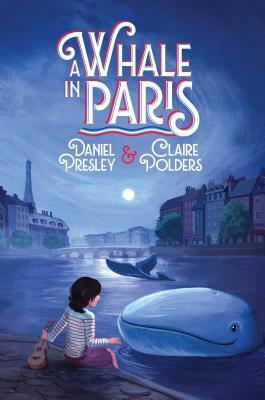 She lives with her husband, American screenwriter Daniel Presley in Paris, and together they are the creators of A Whale in Paris. "Franklin, his unlikely appearance in Paris, and his anthropomorphic personality invoke an unexpected but delightful air of magic. Chantal is a compelling and compassionate character. This debut novel set in Nazi-occupied Paris will engage and charm young readers."